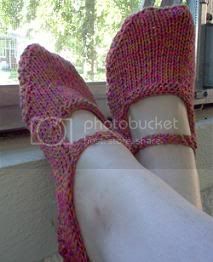 If you know how to knit and have a little time, I highly recommend making yourself a pair using this free pattern from knitwhimsies.blogspot.com. I just added a couple of buttons and lazy daisy stitches to jazz them up, but they are adorable without as seen below in the picture from knitwhimsies. I also highly recommend knittinghelp.com for any knitting concerns you may have. They have the most helpful videos. Now for something not so adorable. This is me bending in half to take the picture shown above. You'd think a girl would learn to set a camera timer once in a while or at least take a shower before dinner time. Your pic is a classic 'Tabi look' how I miss the good old days. I love your mary janes, especially the buttons. They make the shoe. I realize you'd probably rather be knitting than answering questions from a newbie, but here goes. 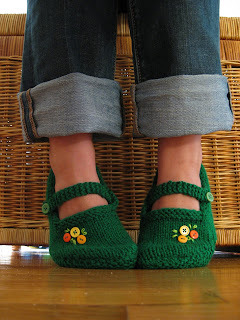 Did you take any photos of the process of knitting and assembling the slippers? I'm adept at knitting the different stitches, but am lacking confidence on assembling the pieces. I've always struggled with visualization. If you whip up another pair, could you take a few photos and post to your blog?